‘Life As A Dream’, a solo show of the most recent work by Igor Tcholaria, is inspired by both the Commedia dell’Arte and the Circus. This is a rare opportunity to see the work of this St Petersburg based artist in London whose art influenced by Picasso and Modigliani was banned in Soviet Russia. 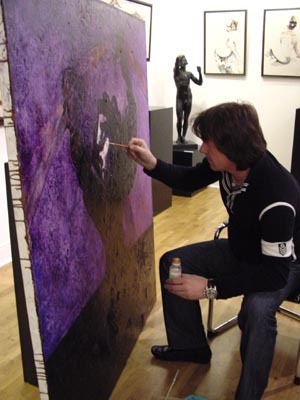 His work is eagerly sought out by many contemporary collectors across the world. His fourth book is being published this Autumn to tie in with a retrospective show in The Netherlands and an exhibition in the State Russian Museum in St Petersburg. Tcholaria has had many commissions the most recent were two four metre works for Cunard’s Queen Mary II; as well as some pieces hanging in the May Fair Hotel in London. He was also chosen to customise a Volvo C60 to be auctioned by Phillips de Pury at the Millionaires Fair in Moscow. He later won the Gold medal for the graphics carried out on a customised Volvo S70 in Moscow in March 2009. His work is to be found in many international collections, both private and corporate. His influences are many and he certainly pays homage to Picasso as can be seen in both his composition and palette in ‘Petrushka’ and ‘General On A Horse’. His portrait work seen in this exhibition particularly ‘Marianna’, ‘Elena’ and ‘Liza’ have the long sinuous necks and beautiful oval faces that define Modigliani’s hand. ‘Life As A Dream’ offers connoisseurs the opportunity to see how seldom seen bronzes from Rodin’s golden age and the work of Igor Tcholaria compliment each other in an interior; as well as a chance to invest in these two giants of the art world. 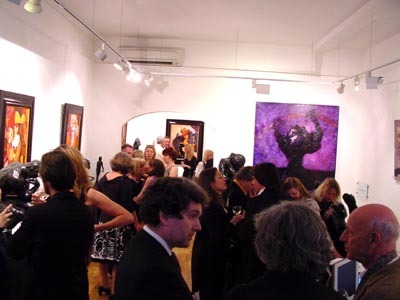 Hay Hill Gallery founded in 1995, has recently relocated to Cork Street. 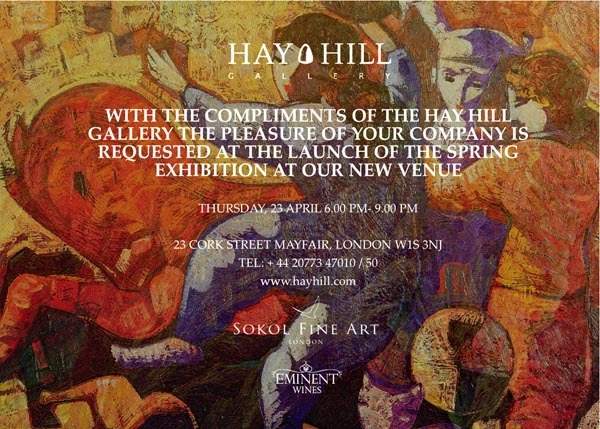 The Hay Hill Gallery was founded as a joint venture between the Russian company Art Service Centre Ltd with over nine years experience of the international art scene, and the British company Sirin Ltd. The Hay Hill Gallery continues to introduce modern artists whose work pays homage to academic traditions; and mount exhibitions focussing on sculpture and international art. 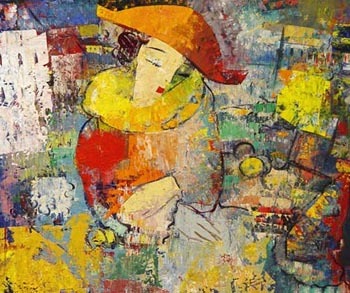 Born in 1959 in a small charming town on the Black Sea coast of Georgia, Igor Tcholaria has participated in about a hundred exhibitions at home and abroad. His superb technical mastery is undoubtedly attributable to his rigorous art training by his excellent teachers at the Sukhumi Art School, Georgia, and further at the Academy of Fine Arts, St. Petersburg from which he graduated in 1985. It was there that he acquired his consummate skills in various classical and modern artistic techniques and came to develop a unique, recognizable style of his own. While occasionally drawing upon classical elements, he has nevertheless learned to organise the space of his canvasses with originality and aplomb. Hence the oscillating specks of colour reminiscent of Cézanne which punctuate the swathes of darkness tinged with gold by the passing of time and conjure Rembrandt’s chiaroscuro. Igor Tcholaria is greatly inspired by the French impressionists, Picasso and Modigliani, which was not welcomed as Soviet official art. As a result he had to leave the Academy and find his own way in art. The hard life of a soviet unofficial artist came to an end when Gorbachov’s Perestroika started. Perdita Sinclair (b.1978) works from her studio in Brighton. Born in Surrey, she studied at Howard Gardens in Cardiff and has gone on to exhibit extensively over the U.K. 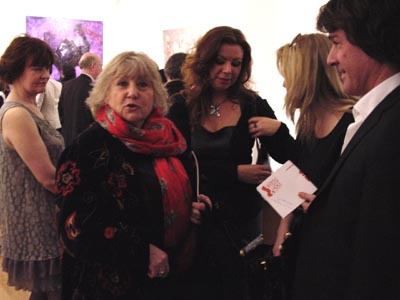 Her work has been influenced by a number of subjects including lepidoptery (the study of butterflies and moths), the aquatic ape hypothesis, Darwinism and the synergy of the human body with different landscapes. She uses the power of suggestion and trace and brings in references to modern as well as ancient cultures. Taking an unorthodox approach to painting Perdita paints onto raw canvas. This influences her choice of pallet and establishes the direction to which she paints. Her use of colour, washes and line are concentrated mainly on selected areas of the canvas. She has developed a technique of building transparency and texture by using water based washes followed by acrylic glazes which support oil paints. Alongside her distinctive figurative work she has started to gain recognition for her portraiture. In 2007 Perdita was selected for the BP Portrait Awards which exhibits at The National Portrait Gallery in London, The Laing gallery in Newcastle and The National Portrait Gallery of Scotland. 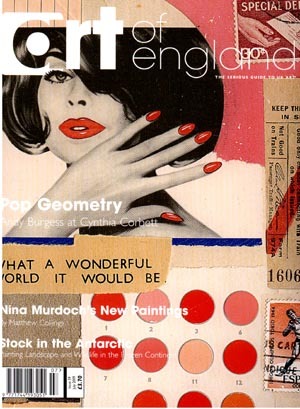 In 2008 she was exhibited in The Summer Exhibition at the Royal Academy of Art, London. So far in 2009 she exhibited at the National Portrait Gallery Gala. She has also participated in the year of Darwin by giving a visual lecture to the Bath Royal Literary and Scientific Institution about the evolutionary themes in her work. This lecture will subsequently be published. 'Life As A Dream', a solo show of the most recent work by Igor Tcholaria, is inspired by both the Commedia dell'Arte and the Circus. This is a rare opportunity to see the work of this St Petersburg based artist whose art, influenced by Picasso and Modigliani, was banned in Soviet Russia. 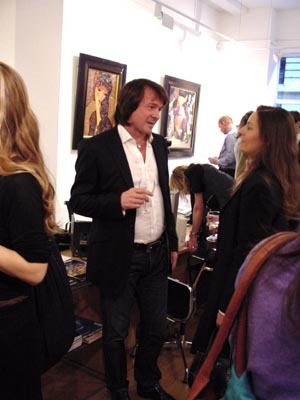 His work is eagerly sought out by many contemporary collectors across the world. His fourth book is being published this autumn to tie in with a retrospective show in The Netherlands and an exhibition in the State Russian Museum in St Petersburg. 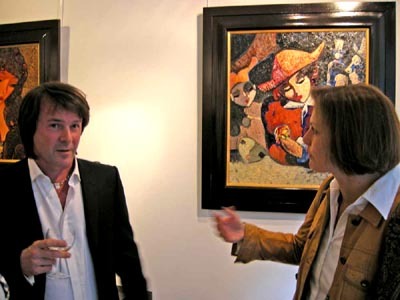 Born in 1959 in a small charming town on the Black Sea coast of Georgia, Igor Tcholaria has participated in about a hundred exhibitions at home and abroad. His superb technical mastery is undoubtedly attributable to his rigorous art training by his excellent teachers at the Sukhumi Art School, Georgia, and further at the Academy of Fine Arts, St. Petersburg from which he graduated in 1985. It was there that he acquired his consummate skills in various classical and modern artistic techniques and came to develop a unique, recognisable style of his own. While occasionally drawing upon classical elements, he has nevertheless learned to organise the space of his canvasses with originality and aplomb. The exhibition will also introduce an unprecendented collection of 50 iconic bronze sculptures by Auguste Rodin. This collection of posthumous production works are cast from foundry plasters. 'Lite As A Dream' offers connoisseurs the opportunity to see bow seldom seen bronzes from Rodin's golden age and the work of Igor Tcholaria compliment each other in an interior; as well as a chance to invest in these two giants of the art world. 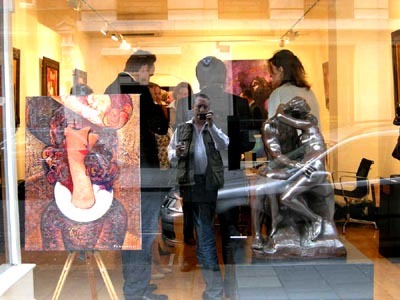 The solo show will run until Saturday 16 May at the Hay Hill Gallery at 23 Cork Street, W1. 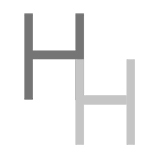 www.hayhill.com Telephone 020 7734 7010. Life As A Dream, the solo exhibition of the most recent paintings by the inspirational Russian artist Igor Tcholaria, has just drawn to a close. This was a rare opportunity to see the work of this St Petersburg-based artist, whose art, influenced by Picasso and Modigliani, was once banned in Soviet Russia. His vibrant canvases speak of the freedom he now enjoys to practise his art unencumbered by political restraints. However, his superb technical mastery is undoubtedly attributable to his rigorous art training by his excellent teachers at the Sukhumi Art School, Georgia, and further at the Academy of Fine Arts, St. Petersburg from which he graduated in 1985. It was there that he acquired his consummate skills in various classical and modern artistic techniques and came to develop a unique, recognisable style of his own. While occasionally drawing upon classical elements, he has nevertheless learned to organise the space of his canvases with originality and aplomb, painting with surety and an easy elegance. 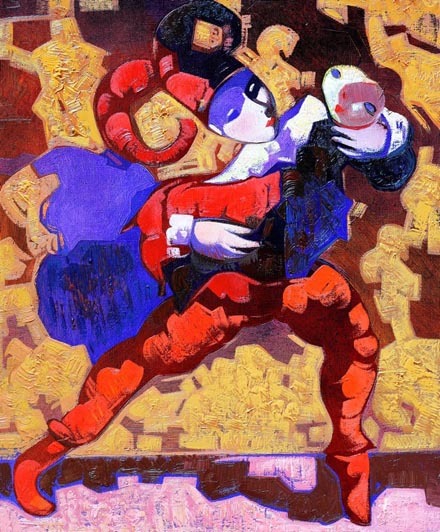 The subject matter of his latest work may be inspired by both the Commedia dell'Arte and the circus, but Tcholaria's choice of composition and palette in such paintings as Petrushka and Clown on a Horse clearly pays homage to Picasso. Whilst his portrait work, particularly Marianna, Elena and Liza, features the long sinuous necks and beautiful oval faces that define Modigliani's hand. Commenting on Tcholaria's recent work French art critic Remi de Cnodder AICA, said, "The artist wants to experience life as a celebration and a drama at the same time. This explains the fact that he focuses his imagination on the world of dance, ballet, and circus with its variety of characters, including clowns, musicians and acrobats. They arouse intense emotions, nostalgia, love and passion and become elements in enchanting compositions." 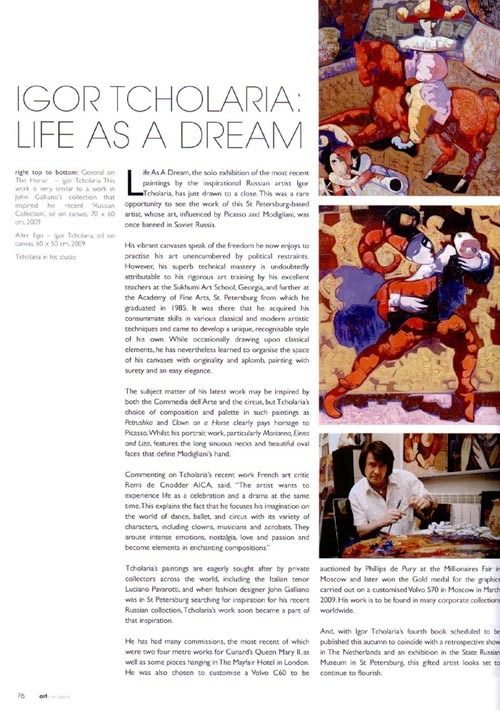 Tcholaria's paintings are eagerly sought after by private collectors across the world, including the Italian tenor Luciano Pavarotti, and when fashion designer John Galliano was in St Petersburg searching for inspiration for his recent Russian collection, Tcholaria's work soon became a part of that inspiration. He has had many commissions, the most recent of which were two four metre works for Cunard's Queen Mary II, as well as some pieces hanging in The Mayfair Hotel in London. He was also chosen to customise a Volvo C60 to be auctioned by Phillips de Pury at the Millionaires Fair in Moscow and later won the Gold medal for the graphics carried out on a customised Volvo S70 in Moscow in March 2009. His work is to be found in many corporate collections worldwide. And, with Igor Tcholaria's fourth book scheduled to be published this autumn to coincide with a retrospective show in The Netherlands and an exhibition in the State Russian Museum in St Petersburg, this gifted artist looks set to continue to flourish. April 15, 2009 - ‘Life As A Dream’, a solo show of the most recent work by Igor Tcholaria, is inspired by both the Commedia dell’Arte and the Circus. This is a rare opportunity to see the work of this St Petersburg based artist in London whose art influenced by Picasso and Modigliani was banned in Soviet Russia. 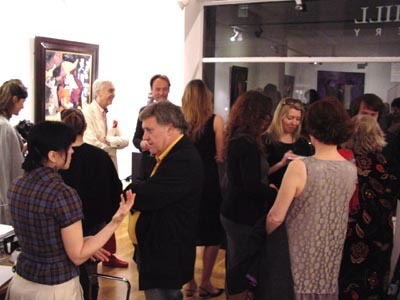 His work is eagerly sought out by many contemporary collectors across the world. His fourth book is being published this Autumn to tie in with a retrospective show in The Netherlands and an exhibition in the State Russian Museum in St Petersburg. Tcholaria has had many commissions the most recent were two four metre works for Cunard’s Queen Mary II; as well as some pieces hanging in The Mayfair Hotel in London. He was also chosen to customise a Volvo C60 to be auctioned by Phillips de Pury at the Millionaires Fair in Moscow. He later won the Gold medal for the graphics carried out on a customised Volvo S70 in Moscow in March 2009. His work is to be found in many international collections, both private and corporate. His influences are many and he certainly pays homage to Picasso as can be seen in both his composition and palette in ‘Petrushka’ and ‘Clown on a Horse’. His portrait work seen in this exhibition particularly ‘Marianna’, ‘Elena’ and ‘Liza’ have the long sinuous necks and beautiful oval faces that define Modigliani’s hand. 'Life As A Dream', a solo show of the most recent work by Igor Tcholaria, is inspired by both the Commedia dell'Arte and the Circus. This is a rare opportunity to see the work of this St Petersburg based artist in London whose art influenced by Picasso and Modigliani was banned in Soviet Russia. 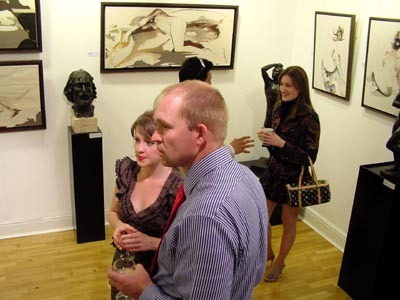 His work is eagerly sought out by many contemporary collectors across the world. John Galliano, one of of his collectors was inspired by the artistis work for his recent Russian Collection. His fourth book is being published this Autumn to tie in with a retrospective show in The Netherlands and an exhibition in the State Russian Museum in St Petersburg. 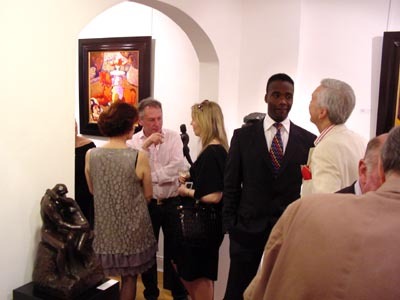 Tcholaria has had many commissions the most recent were two four metre works for Cunard's Queen Mary II; as well as some pieces hanging in The Mayfair Hotel in London. He was also chosen to customise a Volvo C60 to be auctioned by Phillips de Pury at the Millionaires Fair in Moscow. He later won the Gold medal for the graphics carried out on a customised Volvo S70 in Moscow in March 2009. His work is to be found in many international collections, both private and corporate. ‘Life As A Dream' offers connoisseurs the opportunity to see how seldom seen bronzes from Rodin's golden age and the work of Igor Tcholaria compliment each other in an interior; as well as a chance to invest in these two giants of the art world. 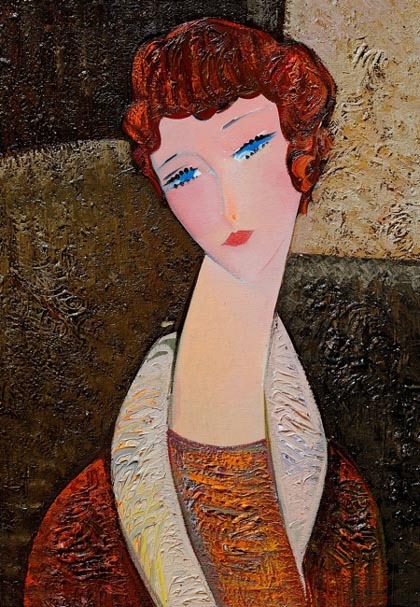 Russian artist Igor Tcholaria’s reworks Modigliani’s women, Picasso, the Commedia dell’Arte and the circus. Tcholaria’s work was once banned by the Soviet state; considered “too radical” according to his agent. This all changed once the art establishment became less in awe of those in power and began to question their motives. 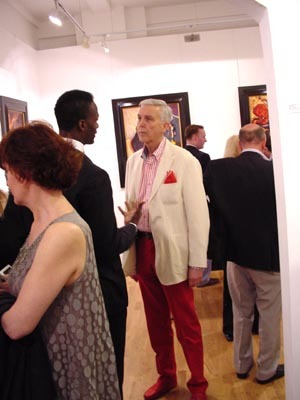 A selection of his work opens at Hay Hill gallery in Mayfair this week. 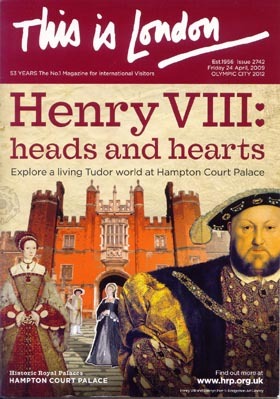 For a taster click here. I grew up with a Modigliani reproduction my mother bought at the Chicago Museum of Fine Arts’ gift shop. Since I looked at it everyday it became a part of me. I have always swooned over everything he paints. The exhibition sounds wonderful based on your taster. Too bad I have to wait until next year to be in London. They all have wierdly long necks, albeit that was a mark of beauty … and my first wife … whom I met in Russian class … had a swan’s neck … and looked ALOT like Lyudmila Savelyeva, who had a graceful neck and played Natasha in Bondarchuk’s definitive film of War and Peace (1967). When I was about 10 years old in the 1950s, about 4 of us Brittany Lane kids were sitting around talking, scared by the world situation … having been crawling under our desks at schook in preparation for the THERMONUCLEAR WAR which could happen at any moment. Finally, we decided that we should just use ALL of our atomic bombs at once and kill ALL the Russians INSTANTLY, before they could hit back! There was shock — nay, HORROR — on my friends’ faces. OUR All-American Natalie Wood was Russian?! Then someone else opined that if Russian girls were so beautiful, we couldn’t kill them. So my solution was that we would only kill all the Russian MEN … but then we couldn’t figure out exactly how to do that without hurting Russian girls … and it became all too complex … to the point we finally decided to go play some (base)ball and let someone else figure it out. Natalie probably never knew how she saved all of Russia from the Brittany Lane kids, but I’ve often wondered how many times the beauty of Russian, Ukrainian, Belorussian, Polish, and other Slavic women has saved their peoples from total annihilation down through history. 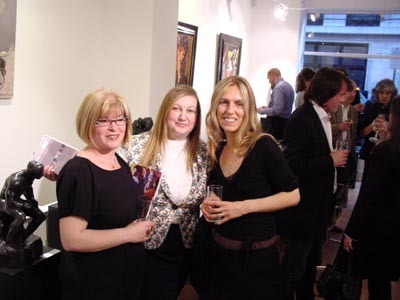 And the Russian girls I met in my heyday on IRC (more than a few years ago, now) … WELL … !! I’ve often wondered whatever happened to Jana P., Kissa, Irinka, Blondinka, Brunetka, Zo Ruchka, Bunny, …?? I can only hope now that they are safe and the mothers of MANY equally beautiful daughters. Surely the beauty of the armade of heavy tanks JS-2 (”Joseph Stalin-2″), that would concentrate on the banks of British Channel in 2 days after the start of WW3, rain or shine, was more eloquent. Even if the the JS-2s you seem to prefer over beautiful women had made it to the Channel, there would have been nothing and probably no one left for their crews to go home to. Thankfully, that insanity never happened. In the film Gorky Park, Arkady Renko tells Irina he must go back to Moscow because he is a Russian. Have you seen the film? And as to tanks, I think I’d enjoy to playing against you across one of my gameboards. Do you think you could hold Moscow? Or would you prefer to try to take it? 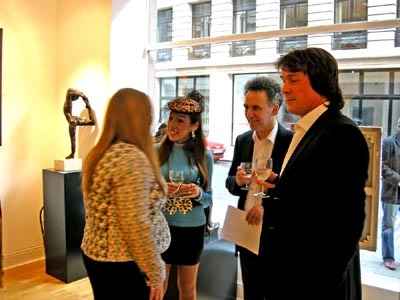 London-based Russian specialist Mikhail Zaitsev has moved his Hay Hill Gallery to 23 Cork Street in Mayfair. 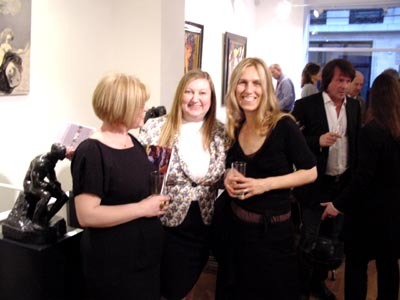 The gallery was founded in 1995 as a joint venture between the Russian company Art Service Centre Ltd and the British company Sirin Ltd to exhibit modern artists whose work pays homage to academic traditions. 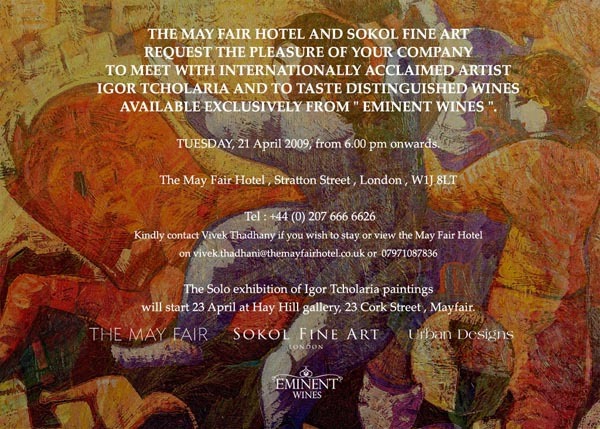 Currently showing (to 16 May) is Igor Tcholaria, a Russian artist inspired by Picasso, Modigliani and the French Impressionists. 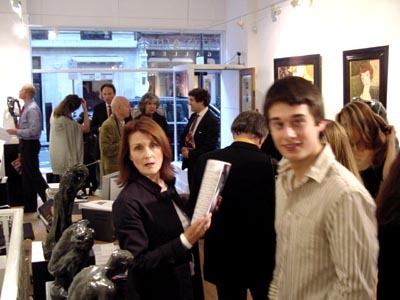 After moving from their eponymous premises on Hay Hill in London’s Mayfair, the Hay Hill Gallery is now firmly established not far away at 23 Cork Street, London W1 (Tel:020 7734 7010). 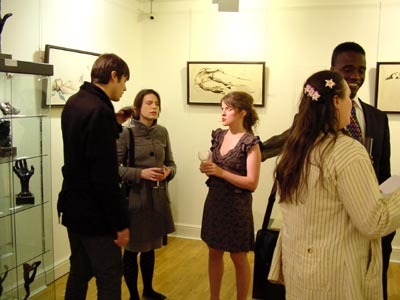 The first major show at the new gallery opened at the beginning of last week and continues until May 16. 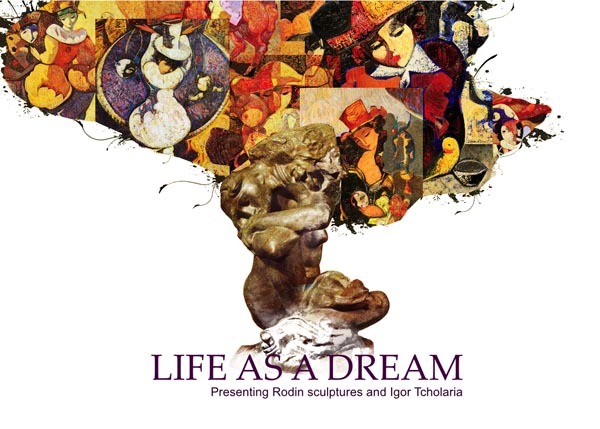 Under the title Life As A Dream, it juxtaposes a solo exhibition of the most recent work by leading Russian artist Igor Tcholaria and a collection of 50 bronze sculptures by Rodin, all limited-edition, posthumous production works cast from foundry plasters. 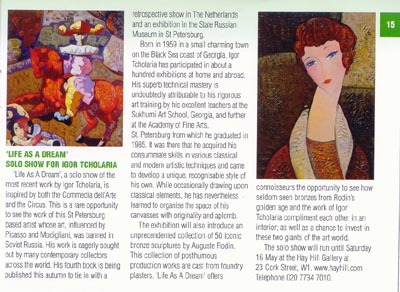 This is a rare London opportunity to see the work of St. Petersburg-based painter Tcholaria, whose art, influenced by Picasso and Modigliani, was banned in Soviet Russia. 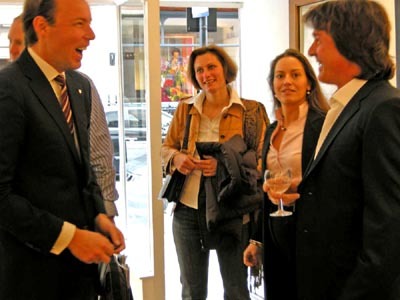 He now has an international following with many clients in the United States, and he undertakes commissions. The latest one which will guarantee him wide exposure to a fairly well-heeled sector of the public. It is from the Cunard shipping line to paint two massive murals for the new liner Queen Mary II. 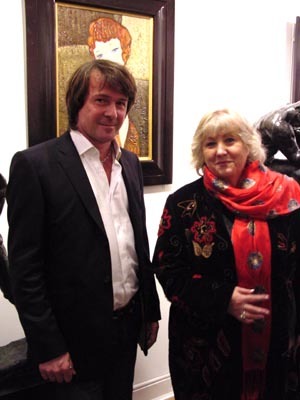 Another fan is top British fashion designer John Galliano, who went to St Petersburg last year looking for inspiration for his new collection, and was sufficiently taken with Tcholaria’s work to buy some paintings. It was noted that Galliano embraced a Russian look at Paris Fashion Week earlier this year. 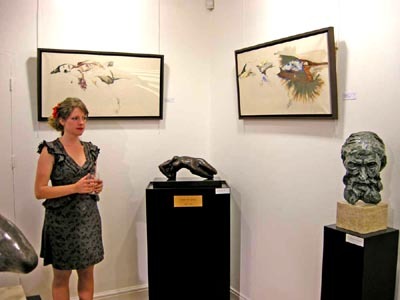 The paintings at Hay Hill Gallery range from £7,000 to £10,000. Igor Tcholaria, the St Petersburg artist whose art was banned in The USSR, is one of Russia’s most well-known contemporary artists. He is collected by international clients, many from the USA. Tcholaria created four murals for Cunard’s Queen Mary II, and added his paintings to Volvo cars for the Millionaire Show in Moscow. 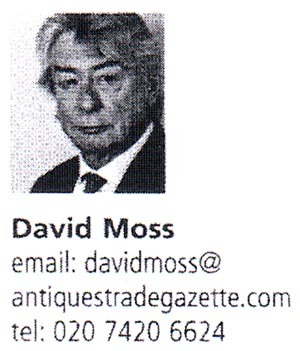 His work is on the collection of The Mayfair Hotel, London. His fourth book is published this Fall to tie in with a show in The Netherlands and an exhibition in the State Russian Museum in St Petersburg. ‘Life As A Dream’ is inspired by the Commedia dell’Arte and the Circus and is a rare opportunity to see Tcholaria’s work in London. The exhibition also introduces a collection of 50 iconic bronze sculptures by Auguste Rodin.